June 1935 Picture ladies in the "Wesley Bible Class"
Picture (c. 1985) of the ladies in the "Watch Class"
History: The following history was written in 1974 by Mr. Harry W. Cullis, member of Madison Street Methodist Church, on the occasion of the church's 100th Anniversary. Let Thy Church rise strong and fair." The singing of this refrain marked the termination of the cornerstone laying ceremonies of Madison Street Methodist Episcopal Church on Wednesday evening July 17th, 1872. A large group of citizens of the community and clergy of several denominations attended, according to the newspaper accounts. This rite also marked the Genesis of a new day for Methodism in Chester. One year and ten months was to elapse before the dedication of our Church on May 3, 1874. A sealed box is customarily placed in each corner stone. Ours was no exception. In it is a tin box containing a Bible, a Hymnal and a copy of the Methodist Discipline. Chester, Delaware County and Philadelphia newspapers were included along with several silver and copper coins. Placed within is a document on which is inscribed the names of all former pastors and the present minister, the names of the trustees, building committee, each subscriber and the amount contributed. The condition of the contents can only be determined if, as and when our edifice is razed. Methodism in the United States is steeped in antiquity. Stemming from the conversion of John Wesley and the founding of the new Church by him on May 24, 1738. From the room on Aldersgate Street in London, England, converts have spread Methodism in many lands. A British army officer, Captain Webb, a Wesley convert, is credited with the founding of the Methodist Society in New York City in 1767. The initial meeting was held in a rigging loft. Later, the first Methodist Church in America was dedicated on John Street in the city of New York on October 30, 1768. It was appropriately named Wesley Chapel. Some time later it was known as John Street Methodist Episcopal Church. Inspired by the success of the Wesley Chapel, Captain Webb journeyed to Philadelphia where in 1769 he organized a Methodist Society. This is now the St. Georges Methodist Episcopal Church. A close associate of John Wesley, namely George Whitefield, made several voyages to the new land. While traveling more than five hundred miles through New York State his inspirational message was the direct cause for the dedication of many churches. He extended his travels through New England with a like result. Exhausted by the rigors of travel and daily preaching, Whitefield became ill in Newburyport. Nor wanting to disappoint anyone, he preached one evening to a large gathering. That night he passed to his reward. The history of "Old St. Georges" being so intertwined with ours, it is well to relate the first Methodist Conference in America convened there on July 14, 1773. The ten ministers attending were informed there were 1,160 members on record. The second Conference was held in the same Church in 1773. The membership as reported was 2,073, almost doubled in less than one year. The transmutation from the Methodist Society of the Methodist Episcopal Church was made in the Lovely Lane Chapel in Baltimore, Maryland on December 24, 1784. Two decades had elapsed between the founding of Methodism in New York City and this historical event. Sixty of the eighty-four ministers in active service attended this meeting. The first Methodist Bishop, Francis Asbury, was appointed on that date. Deacons and Elders were ordained. The first Discipline of the Methodist Episcopal Church was adopted. Of the thirty-nine articles of Religion of the Church of England, twenty-four were retained. Some were slightly changed and with the adoption of a new one, these comprise the twenty-five Articles of Methodist Discipline. Just when the New Faith (Methodism) was brought to Chester was not recorded. It was introduced before the year 1772 as written in the diary of Francis Asbury dated April 8, that year. Bishop Asbury preached in Chester on several occasions as noted in his Journal. Chester Methodists can be justly proud of their association with the primary head of American Methodism. Prior to the outbreak of the Revolutionary War there were eighty traveling preachers, known as circuit riders. Local preachers administered to the needs of the hundreds of members and many "listeners". All wars bring tragedy and hardship. The Revolutionary War was no exception. It dissolved the civil and ecclesiastical relations between the Mother Country and her Colony. Despite the loss of many Clergy who either fled the land or entered political or military life, the seeds of the new church had been so skillfully planted, it flourished here and in England, despite troubled times. To complete the entire picture of Methodism in Chester in general and our Church in particular, we must hearken back to our origin in 1818. A local preacher at St. Georges Church in Philadelphia by the name of John Kelley moved his household goods and family in a Conestoga wagon from that city to Chester. Their new abode was on High Street (Market Street) near Filbert Street (Second Street). The old Steamboat Hotel was in close proximity. This hostelry was reputed to have been shelled by a British warship. A circular window was later installed in the opening. During a conversation one Saturday evening with a neighbor, Mrs. Evans, the Kelleys learned there was no Methodist Church (or Chapel as it was called in those days) in Chester. Across High Street close to James Street (Third Street) was a brick Quaker Meetinghouse. The Episcopal Church was on James Street near Back Street (Welsh Street). John Kelley, as a local preacher, invited his neighbors to worship with him in his home. What began as a "class meeting", an institution peculiar to Methodism, rapidly outgrew the facilities of the Kelley home. New quarters were found in the Courthouse. For years the Sunday Services were held there. Despite the hard benches, the building was well filled even to overflowing, many standing on the outside. The growth of this group came to the attention of the traveling preachers and soon the circuit riders established regular preaching appointments in Chester, both in the Court House and elsewhere. An evangelist, David Abbott from New Jersey became a resident of Chester. He was one of the most effective exhorters of his day and well thought of by Bishop Asbury. The congregation, having outgrown the facilities of the Courthouse, was again faced with the problem of providing ample space to house those attending the meetings. Due to Abbotts dedication and his energy, funds were raised for the first Methodist Church in Chester. The funding was a difficult task but accomplished in time. Kind Providence looked with favor upon the expanding group of Methodists in their endeavor to obtain a place of worship. A suitable building site was conveyed to the Trustees by Matthew Bevan in October 1831. The purchase price of the property was the "princely sum" of $150. The land, about sixty feet by one hundred feet in dimension, provided a building site and a small burial lot. It is recorded the property was conveyed to David Abbott, Henry Powell, John Hill, Trestle Folwell, Samuel Talley, Isaac Higgins and John Lloyd. These were Trustees in trust that they erect a building thereon, a house or place of worship for the use of the Congregation of the Methodist Episcopal Church of the United States of America, governed by the Rules and Discipline. In accordance with the charge set forth in the deed of the lot, a small chapel was erected in the same year. It was appropriately named Asbury Chapel in honor of the first Methodist Bishop. It is strange to relate the name of John Kelley did not appear in the list of Trustees of Asbury Chapel. It is evident he was still in Chester. The small communion table was removed from his home and years later returned to Madison Street Church by Mrs. Arthur Lewis, a direct descendant of John Kelley. It was refinished in 1967 by Henry P. H. Crook and has a place of honor in our Sanctuary. We may form some idea of the size of Chester when the Asbury Chapel was dedicated. The population numbered around 1500 people. The boundaries were possibly limited by the Ridley Creek and the Chester Creek, also from the Delaware River to probably Ninth Street. When the Delaware County National Bank purchased ground for their new bank building on Market Square, the land was grazing ground for a herd of milk cows. Chester Rural Cemetery, established before the Civil War, was exactly what its name implies - rural. For approximately fifteen years after the dedication of Asbury Chapel, the congregation relied upon the services of circuit riders to conduct Divine Services. In 1845 the increase in membership warranted a full time pastoral appointment. There were 65 members on the Church roll, as noted at the annual Conference, when Rev. Isaac R. Merrill was appointed as its first Pastor. As recorded, the Asbury Chapel was incorporated as the Chester Methodist Episcopal Church of Delaware County on June 27, 1846. During the two years of the pastorate of Rev. Merrill, the membership growth began to tax the facilities of the building. The trustees began thinking in terms of a larger edifice. After mature deliberation a new building site was sought. In less than a half century the Methodist Congregation had outlived two places of worship, not including the Courthouse. A building site on the North side of Fifth Street between Market and Edgmont Avenue was conveyed by Dr. William Gray to David Abbott, E. B. Loveland, Henry Powell, Henry Dearr, William S. Williams, John Johnson, Joseph Taylor, William Beck and P. B. Carter, Trustees of the Chester Methodist Episcopal Church of the County of Delaware. A two story stone Church was erected on this site and remained in use from 1846 until 1874. Four years after the dedication of the Fifth Street Church, Rev. Newton Heston reported to the annual Conference there were 130 on its membership rolls and 72 probationers. Those membership figures represent double those of Asbury Chapel. At the close of the year 1851 the membership increased to 173 on the rolls. The women of the Asbury Chapel and the Chester Methodist Church, while in the background, must be considered the backbone of each fund raising. They did not come to the fore until Mrs. William Sharpless proposed the organization of a Ladies Aid Society. While visiting the Frankford Methodist Church in Philadelphia, Mrs. Sharpless learned of the Society and brought the idea back to Chester. The Parsonage of the Fifth Street Church was around the corner on Edgmont Avenue. It was badly in need of furnishings. The Ladies believe this work must be undertaken by them. In due course new carpet was installed. This Society was a part of the Methodist Church for many years. The concrete results of their concerted efforts may be untold perhaps but much in evidence. A pastorate has, at times, a lighter side as recorded by entries made by Dr. Gilroy (1866-1869). He commented upon one marriage at which he officiated. This fellow (the groom) was dressed in the finest style, gold chain and cane and gave the extravagant fee of $1.00 enclosed in a white envelope. I pity the lady who united her destiny with such a poor specimen of humanity. During the 1860s that portion of Chester then known as "uptown" was soon to be termed "downtown". The population of Chester had increased to around six thousand and in a like manner the membership of the Chester Methodist Episcopal Church of Fifth Street grew accordingly. In the year 1869 attention was again directed to securing a building site for the erection of a new Church. The congregation was outgrowing its facilities for the third time. With the passing of the years between 1818 when the initial indoor meeting was held in the home of John Kelley, the congregation worshipped in the Courthouse, the Asbury Chapel then to the Chester Methodist Church on Fifth Street. Now in 1872 they were on the threshold of a new era, that of considering the erection of a new edifice for worship. This might have been a dream come true, if so, that "dream" has stood for a century. There is an inscription on a monument in Washington, D.C. which reads "All that is past is but prologue". That might be applied to Madison Street Church. Here we have a monument to Methodism. From the humble beginning in the home of John Kelley the new Home of Methodism was soon to be erected. The dedication ceremonies of the New Church on Sunday May 3, 1874 were accorded excellent newspaper publicity. The architecture, appointments and furnishings are all familiar to us. Rev. J. B. Maddox served both the Fifth Street Church and Madison Street until replaced by Rev. Welsh in 1875. 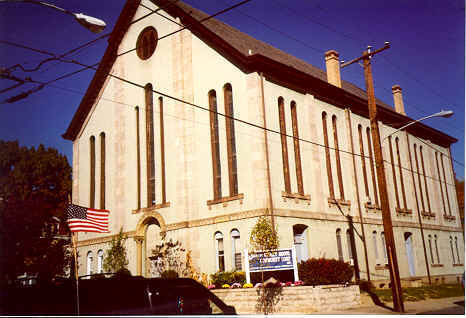 As written in the Delaware County Republican issue of May 8, "the Church will seat one thousand persons, and on Sunday the pews, chancel and aisles far into the vestibule, were densely crowded with people, all anxious to hear Bishop Simpson and other Divines present on the occasion. In the morning Bishop Simpson preached a lengthy and able sermon from Romans 1:16. In the afternoon Rev. Isaac Merrill, who was in charge of the Asbury Chapel for nearly thirty years, gave an interesting historical sketch of the progress of Methodism from its first introduction until the present time. In our new church the Ladies Aid Society continued to function as it formerly did. In 1855 two new Societies were inaugurated. The Womans Foreign Missionary Society with Mrs. Theodore Hyatt as President, Mrs. William Robinson was First Vice President and Mrs. R. Kelso Carter as Second Vice President. Miss Adaline Van Zant succeeded Mrs. Carter shortly thereafter. The Womans Home Missionary Society was organized the same year. Mrs. Theodore Stevens, the wife of the Pastor was president. When the Pastorate of Rev. Stevens was ended at the Church, Miss Addie, as she was affectionately called, assumed the office of the presidency and filled that office until her death in 1907. All these Missionary Societies, together with the Ladies Aid were merged by order of the General Conference in 1940 and became known as the Womans Society of Christian Service. The books of the old societies were closed. Their presidents stepped down after years of faithful service to make way for the new organization. Those presidents retiring were Mrs. William Provost Jr., presiding over the Ladies Aid Society for thirty years, Miss Margaret Sands presided over the Womans Missionary Society for the same number of years and Mrs. Elmer Dutton president of the Womans Foreign Society for a number of years. It would be remiss not to make mention of the young people of the Church who were also organized into Foreign and Home Missionary Societies. The girls and boys helped with the missionary work through the Standard Bearers and the Junior Standard Bearers. The Brotherhood of Andrew and Phillip was activated in the late 1890s, an active organization as was also the Ushers Association. Through the efforts of the Ushers Association the glass paneled doors at the entrance of the Sanctuary replaced the former solid wooden doors. In 1890 to the turn of the century the Church activities reached a new pinnacle. The young parishioners enjoyed both the Senior and Junior Leagues. The Sunday School attendance was as high as 700 each Sabbath. At that period the Sunday School paid for its own organist as well as its chorister. A few years later the Sunday School purchased a baby grand piano for the services. In the early records of the Church is found a reference to the Library with John F. Cullis as librarian. He was assisted by John Taylor in the first floor library and William Burns and William Wilson officiated in the balcony library. Rev. William Paxon was appointed Pastor in 1881. He succeeded Rev. Welsh and Rev. Robinson. The membership then had reached the six hundred mark. During his first pastorate (1881-1885) the entire indebtedness of the Church was liquidated, on both the Church (valued at $40,000) and the parsonage (valued at $5,000). Our Church has undergone a change of its name four times in its history. First the Abbott Chapel, then the Chester Methodist Church of Delaware County. The trustees petitioned the courts in the 1870s to change the name to Madison Street Methodist Episcopal Church, which was granted. Now we function under the title of Madison St. United Methodist Church. A score of ministers have served in the Madison Street pastorate since its first minister. Some were recalled to serve their second pastorate. At the General Conference in 1804, a resolution was adopted limiting preachers to two years in each charge. This evidently has been modified at a later date. There were fifteen Pastors serving the Chester Methodist Church from 1845 to 1872, some of whom served only one year, but none over two years. During the first pastorate of Dr. William Shaffer (1902-1906) our pipe organ was installed. Services were held on the first floor during the installation period. The first organist was Professor Corbett, a master at the console. The choir consisted of an excellent quartet, later replaced by members of the congregation. At the time of the organ installation the pulpit or desk was made by Marshall Miller. Secreted somewhere in this structure is no doubt the name and date of the builder. Organ recitals were frequent and a silver offering taken. Notable among those was "The Storm", so realistic it sent shivers down the spinal column of the younger element. During the second pastorate of Dr. Shaffer (1910-1918) the carriage shed was razed and the corner stone of the Sunday School Chapel was laid. The additional facilities were badly needed for the expanding school. Rev. Frank P. Parkin served the Church between the pastorates of Dr. Shaffer. In succession following him were Rev. A. A. Arthur (1918-1921); Rev. Gladstone Holm (1921-1930); Rev. Alfred Dingee (1930-1932); Rev. Harry D. Robinson, (1932-1937); Rev. Frank Lawrence, (1937-1939); Rev. J. Perry Cox, (1939-1944); Rev. Christian Koppel, (1944-1949); Rev. Horace Olewiler, (1949-1953); Rev. Herbert McKain, (1953-March 1, 1960); Rev. George Overley, our present pastor. Rev. Gladstone Holm was an architect before entering the ministry. He was eminently qualified to supervise the remodeling of the parsonage. This was done at the cost of $22,000. An additional $1,000 was spent on the furnishings, giving Madison Street one of the finest parsonages in the Conference. When Rev. Dingee succeeded Dr. Holm, little did he realize of know of the pathetic circumstances to occur during his charge. On Sunday afternoon, February 1, 1931 the Church, then in its fifty-seventh year, was badly damaged by fire and water. Services were held that night in the YMCA Auditorium and for some time thereafter. The fire was a severe shock to Rev. Dingee, whose health at that time was not of the best. That night on the way home from the services in the YMCA, passing the damaged edifice, a thought came to him. In his study he composed a six stanza poem entitled "The Hurt Church" which he read from the pulpit the following Sunday. The loyalty of which Dr. Dingee wrote of in his poem made restoration possible. Madison Street Church has always been known as the Mother Church of Methodism in Chester. During the period when the church was on Fifth Street, Trinity and Upland Methodist Churches were dedicated. Aided by Trinity Church the South Chester Methodist Church was founded. Through the efforts of the local preachers of Madison Street, Methodist congregations were established in Eddystone, Ridley Park, Norwood and Sharon Hill. Under the direction of Rev. Frank D. Lawrence, Sunday, October 17, 1937 was designated as Homecoming Day. In the program for that day was the Story of Our Church, referring to its inception in 1818 by John Kelley. While the details were not recorded, the story was declared to be true to life and dovetailed into known facts. The morning and evening services were well attended. The sermon was delivered by Rev. Virgil E. Rorer, D. D.
A comprehensive history of Madison Street Church was written in 1940 by Henry B. Cox, son of Rev. J. Perry Cox. Miss Mabel Talley wrote a brief history of our church for the seventy-fifth Anniversary in 1949. Each of these writings indicates much research and time had to be devoted to the compilation. It is from these and other chronicles this history has been compiled. The concluding paragraph of Miss Talleys writing cannot be improved upon. It is quoted in full herein. "The history of Madison Street Church has never been half told; it cannot be in limited space. We touch the highlights here and there and those whose leaderships come to mind. The years inevitable bring changes, but the work despite mergers and new setups, goes on. AS we turn the leaves of our Book of Memories, we see how the Torch, once lighted so long ago, has passed from hand to hand, down through the years. Let us, the present day, see to it that the light, as it is passed through our hands, neither flickers or dies." This was written a quarter of a century ago. Miss Talley would never lay claim to be a prophetess, but prophetic she was when she wrote the years inevitably bring changes. The new setups Miss Talley referred to evidently was the merging of the various societies in 1940 into the Womans Society of Christian Service. The change referred to is here. Attendance at Sunday services at present can attest to this. What has brought about these conditions as they exist now? Many facets are in the picture with not one definitely responsible. We, of the present generation have witnessed the decline in attendance, gradual at first. So gradual it went practically unnoticed for quite a period. Father Time may be a responsible party. Numberless changes due to death, marriages, moves from the area, transfers, retirement and sundry other reasons can be given. When considering the cause and effect of the changes, a multiplicity of reasons must be taken into consideration. Just as the congregation of Abbott Chapel was confronted with a serious problem, seemingly unsolvable for a time, we the present congregation are faced with a similar situation, a problem for which no solution has, as yet, been forthcoming. Our next move must be the correct one. Divine Guidance is earnestly sought for the answers. Whomever narrates the next history of Our Church may recount for future generations the result of our endeavors to arrive at a solution to the questions before the present congregation. Ours is a rich heritage which cannot, yea it must not go for naught. A century of Madison Street Churchs services to the community cannot lightly be deleted from the pages of its history. But the set of the sails that determine the way they go. � 2000, 2006 John A. Bullock III.